They say journalism is the first draft of history. Get ready for the second, then. Sacramento Bee reporter Peter Hecht is releasing his new book Weed Land - Inside America's Marijuana Epicenter and How Pot Went Legit on March 7 on the University of California Press, we've learned. Good for Peter! We love reading his SacBee reporting and can’t wait to see what he’s dug up. We even have a first chapter available here, which covers the DEA raid of the Women’s Alliance for Medical Marijuana in Santa Cruz, and the fallout, with some telling information on the DEA’s side. Hecht hit the weed beat for the Bee in 2009 and covered Prop 19 in 2010. The former Los Angeles bureau chief for the Bee has reported from nine countries in Latin America, and was a visiting professor of journalism at Universidad Peruana de Ciencias Aplicadas in Lima, Peru, on behalf of the International Center for Journalists. He holds a master’s in Latin American and International Studies from California State University, Sacramento, and was a graduate fellow in international journalism at the University of Southern California. He also has a BA in communications from California State University, Fullerton. He lives in Diamond Springs, California. UC Press is the non-profit publishing arm of the University of California system, and is offering a 20 percent discount here, with promotion code 14W6039. 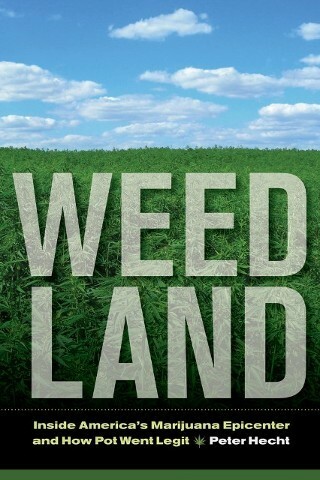 Weed Land is also available for order on Amazon and Barnes & Noble.